Alicia Barnes, a TV news anchor for the ABC affiliate and a former reporter at 11 Alive News, recently married Jacob John Jr. in Columbia, SC. All her saris and those of the bridesmaids were custom designed by Rani Sharma. 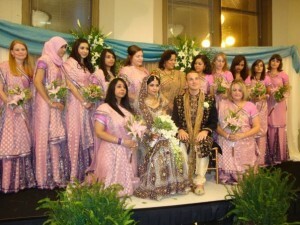 All “the sisters” wore different style saris, and had uniform tops that were an iridescent champagne color. 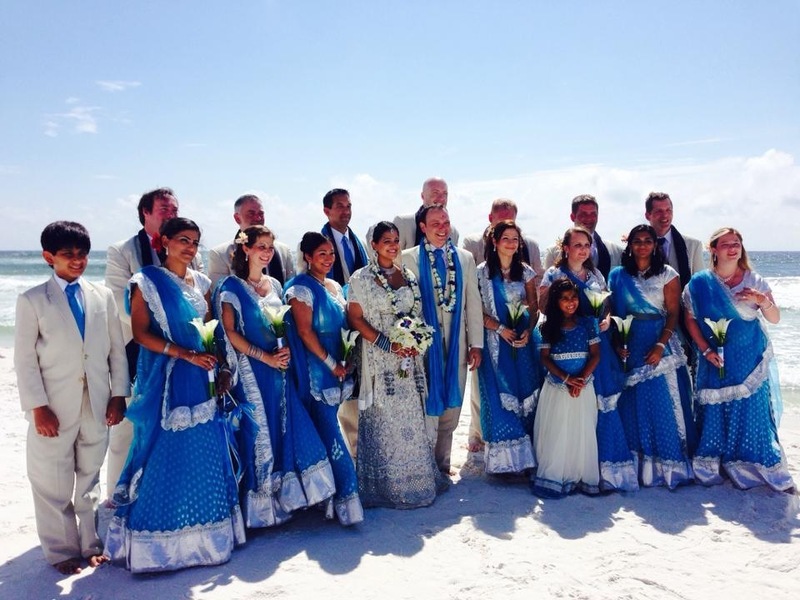 “I could not have asked for Rani to design a more fitting red sari for me! I was in heaven when I saw it,” said Alicia. A bride of the east or west always looks radiant. So, it is important that the bride chooses the right dresses so that her wedding dress does not clash with her bridesmaids dresses in life or in pictures. 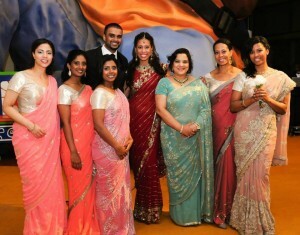 The bride should make sure that the Indian bridesmaids’ outfits color co- ordinate with her dress. 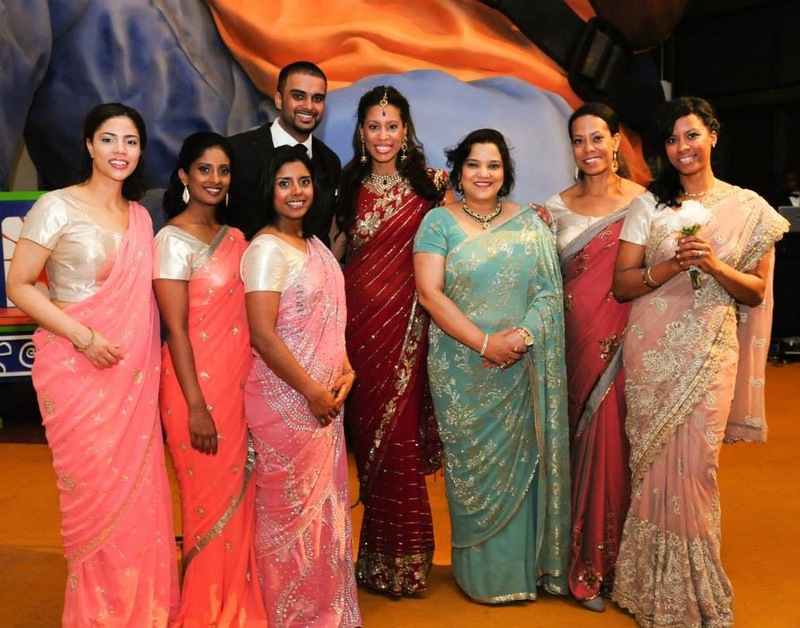 If the bride is wearing a red dress, the Indian bridesmaids’ outfits could be maroon, pink, orange, gold or silver. 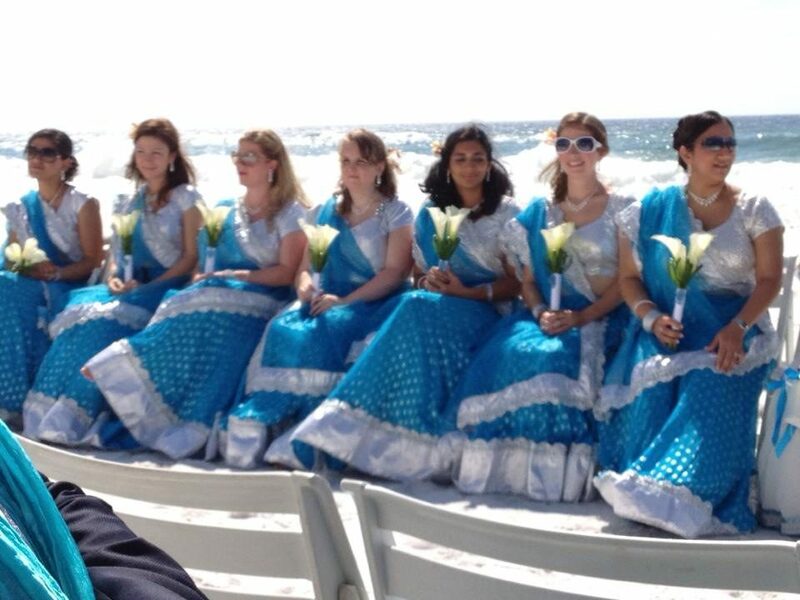 Indian bridesmaid dresses ask for a vibrant look. Indian, Asian, and American bridesmaids’ dresses could all be alike or they could be different styles and shades of the same color. This allows the bride the flexibility of choosing outfits according to the physique and complexion of the wearer. Blouses can be customized too these days- from the cut of the neckline to the back to the sleeves. Jewelry: The bridesmaids’ jewelry could be silver or golden but they are a must for the Indian look. While the bride is planning her Indian bridesmaids’ outfits footwear should be such that it complements the dress for a glamorous outlook. Go for silver footwear if the dress has silver work on it and if it has golden work go for golden footwear . Hair: If the sari is very stylish, then a hair up do would complete the outlook . If the bridesmaids are wearing lehengas, then either an up-do or letting the hair down- both would work well. Get catty with cat-eye makeup!